The Town Link Rank can be found in your Communication Menu. Just press the X Button on your Nintendo 3DS to open the main menu, and then select the pencil-and-paper icon. Each town has their own bar graph that indicates your relationship with the town. 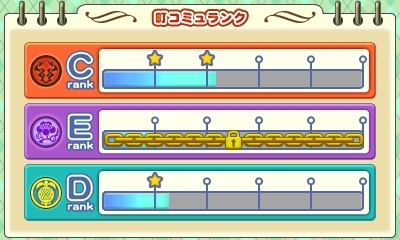 Starting from Rank E, you can increase your link with the town up to Rank D, Rank C, Rank B, Rank A, and finally Rank S. The higher your Town Link Rank, the more variety of items for sale at the town shops. Each time you increase the bar to the next level (up to Rank A), the rank will lock until you complete the tasks needed to unlock the next rank. A notification alert will appear on your 3DS top screen when you've hit a link lock, when you have completed an unlock requirement, and again when you have finished all of your tasks to break the lock and move onto the next link rank. After you unlock the next level, you'll receive letters in your mailbox from the vendors who have new items for sale at their shops. Maximizing all towns to Rank S is a secondary goal in the game. Your primary objective is to convince your father that farming is a viable career. When you do reach Rank A with all the towns, you will have a multi-town celebration where the villagers will thank you for helping them restore the prosperity of their towns. The party will earn you +4000 FP with all of the villagers and +10 AP with all the marriage candidates. The party will end back at your house at 11:00 after you see the game's ending credits. Dessie will also give you an additional stamina heart if your personality type supports stamina increases. You'll have a town-specific party when you reach Rank S with each of the towns. The game will continue to play after you see the ending credits. Shipping items to a town will increase the rank of that town. Just remember to set the destination of your shipping bin. The more you earn from shipping, the more town link you'll earn. Tiny increases will come from buying items from a town's shops, using the town's quick fast transport option (wagon, palanquin, or elephant), wrapping gifts at the available shops, mailing a letter to a town's villager, or eating lunch with a town villager. Making a Farm Circle that is themed to the town will also give you a tiny amount of link rank. Completing part-time jobs and giving a special +1000 FP gift to a villager will give you small increases to the link rank. You can get medium increases by eating at town restaurants, buying cultural recipes from the restaurants, making clothing and accessories, participating in the town specific festivals (Stew Festival, Flower Festival, or Fruit Festiva), or winning the multi-town harvest, animal, and pet show. Large boosts to the Town Link Rank come from buying animals for your farm, participating in the town's deity festival (Goddess Festival, Rice Festival, or Offering Festival), triggering friend events or love events, and winning the Game, Drink, Cooking, and Fashion festivals. The largest boost to the Town Link Rank is from getting married or going steady with a town's marriage candidate, participating in the town's romance festivals (Night Sky, Tananba, or Starry Night), and celebrating New Years with the townsfolk. You also earn Town Link Rank with all of the towns when your child is born.